What the parents receive just looks like a text message. As with student test data, which is sometimes released too late in the school year for teachers to make any adjustments in their instruction — input from parents, in the form of annual surveys, might not make it to school leaders in timely way. A mild concern shared among parents at morning drop off or posted in a Facebook group might escalate into a full-blown problem before principals know about it. While parent surveys can help school leaders identify overall trends, response rates are typically low and, they don’t provide real-time input on what students and their parents are experiencing that particular day or week. Parents are also likely to start ignoring requests to complete surveys if they receive too many. Principals can monitor social media for posts related to their school, but those comments might not be an accurate reflection of the school community. 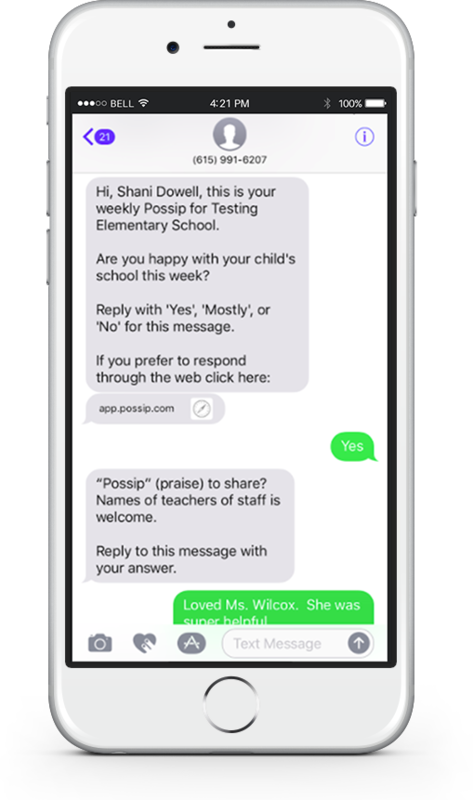 Shani Dowell, a parent and former educator, developed the system to give administrators an easier way to tap into what parents have to say, and it still takes advantage of the mobile technology that most parents are already checking consistently throughout the day. Each Monday, principals receive a summary of parents’ responses from the previous Friday. Principals can also designate another administrator in the building to receive the reports. So far, 80 schools across 16 states have implemented the system, and Dowell expects more to sign up throughout this school year. The start-up is also developing a version that will allow high school students to participate. Watechia Lawless, the principal of Napier Enhanced Option Elementary School, also in Nashville, used the system to ask parents what topics they wanted to learn about at “family suppers,” which also increased attendance at the gatherings. Through the system, administrators also learned that parents needed after-school programs for their children in pre-K, so now the school is providing after-school care for those students in collaboration with a community-based partner organization. She added that parents are also now less likely to come to school “emotionally charged” over an issue they feel isn’t being addressed because now they have frequent opportunities to share their concerns. In her work with the National Network of Partnership Schools, Johns Hopkins University professor Joyce Epstein finds that schools are now using a variety of apps, email programs and other digital tools to communicate with families. But like Dowell, she finds that most methods are a one-way conversation. Principals using the program, however, say it has helped them hear from parents that might not have spoken up before. Lawless, for example, said she’s now hearing from more Spanish-speaking parents. And Friedman said he thinks Possip could be “a tool for equity.” While some parents, he added, are never shy about sharing their opinions, others might be more reticent.